This page is here to answer any questions you might have about adopting into our family. These are personal notes from persons who have our babies now. We also have a list available that can be emailed or called to answer any other questions you might have. 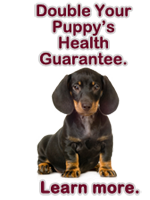 We also have written contracts with health and quality guarantees that we will be glad to email, fax or mail to you. Please let us know how we can better help you feel comfortable joining our family. This is Amber Edens! 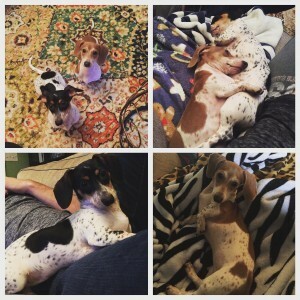 My husband and I( and my parents ) met you back in August as we can to your house and purchased the two piebald sisters from you. I just wanted to share a picture with you of what they look like now and tell you how much we absolutely adore them! Piper is the black one and Pawley is the red one! 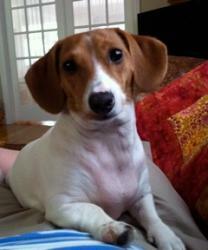 Piper was the runt of your litter who has outgrown her sister Pawley. Piper weighs about 9 pounds and Pawley weighs about 6! Love my miniature girls! They are full of love and are definitely lap dogs, we couldn’t be happier! When we got them,they left behind a beautiful little brother. I know you considered keeping him yourself, how is he? We always talk about him and wonder how he is doing and what he looks like now! We wish we would’ve brought him home too! Just wanted to share a little with you and let you know how these babies are doing! 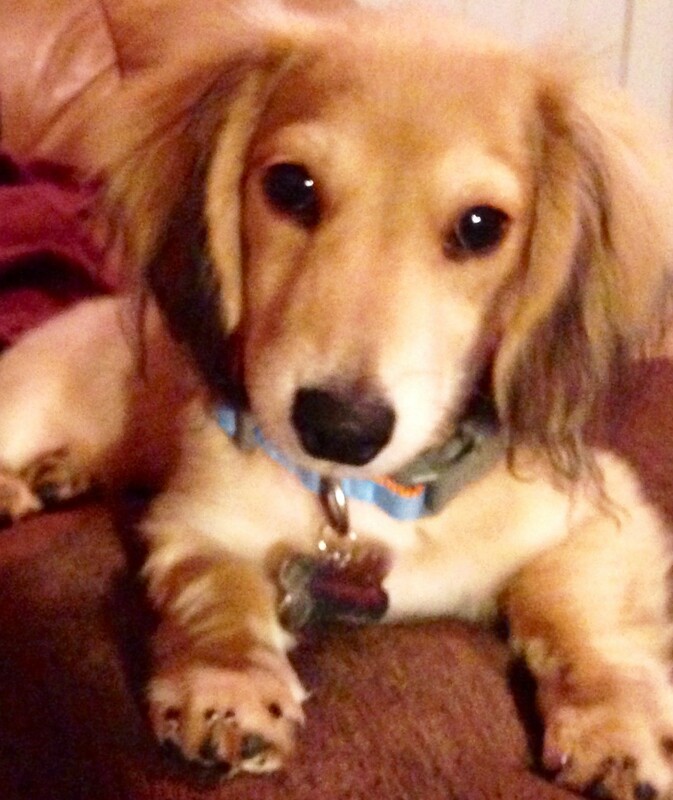 “I just wanted to say thank you for my happy, healthy puppy. She is the highlight of my day and never ceases to amuse me. It’s hard to believe that she’s going to be 8 months old soon!She has really grown into her length and gets prettier by the day. She gets compliments from everyone we meet on our walks and has quite a few “boyfriends.” I have attached a couple pictures of her for you to see. 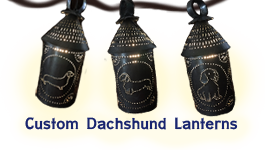 I just wanted to send a quick note of thanks to Lynda and everyone at Heartfelt Dachshunds for allowing us, the Dickinsons, into the Dachshund fraternity. I didn’t know or think that our family needed a pet, dog or otherwise, until little Dutch arrived at the airport in late March 2017. He has brought tremendous joy to our home and warms us each and every day with his unconditional love and affection. No matter how lousy my day has been, and may I say that as a public school teacher, I have had some pretty low ones, when I come through the door at day’s end, Dutch is always there acting like he hasn’t seen me for years. He makes me feel like a super hero, and such a feeling is rejuvenating, bolstering, and, may I add, inspiring. I am accompanying this note with a snap shot of Dutch at the park on a warm summer evening. He is beautiful and garners the admiration of every dog owner we encounter. Lynda, when you told my wife that you breed as much for personality and character as you do the more common traits, I was skeptical; but when we are out and about, Dutch is the envy of everyone. When other ill-behaved dogs snap at him, it rolls off his back. He engages every dog, big or small, like they are his long lost pal, and their owners too! 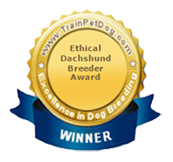 We are so fortunate to have come in contact with Heartfelt Dachshunds. If there is ever anything we can do for you, let us know as we feel as though we are in your debt. I cannot believe that we have had Sydney 9 months already. She is the MOST lovable dog that I have ever been exposed to. She and Sadie (our 11 year old) are the best of friends. Sadie sometimes gets cranky when Sydney’s energy level exceeds hers, but for the most part they are inseparable. Sydney has won the hearts of everyone in the family and she has brought many smiles and laughter into our lives. She is my shadow and is rarely more than 10 ft. from wherever I am. I am attaching some pictures of Sydney and Sadie. I hope you enjoy seeing how adorable she turned out to be. She is a big girl, she weighs in at about 12 1/2 pounds. She has broad shoulders and big paws. When she is with Sadie she makes Sadie look very petite in every way. We get comments wherever we go because most people have not ever seen a piebald. summer. Thanks again for bringing Sydney into our lives. 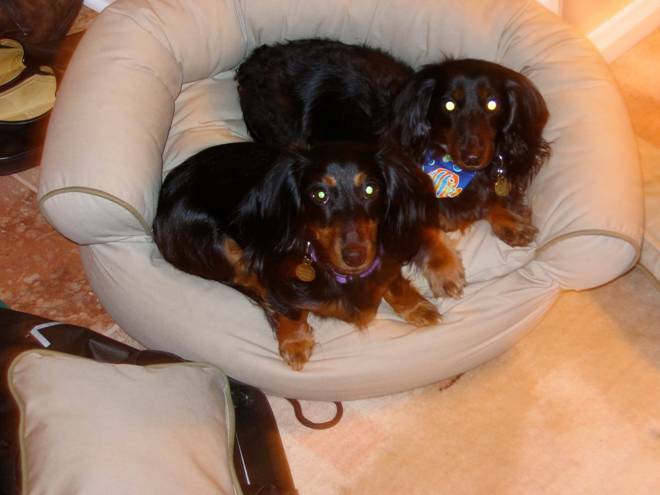 I bought a black and tan puppy from you 4 years ago and my Friends the Bicking’s bough a brown one at the same time. You flew the two dogs to Philadelphia for me to pick up at the air port. I wanted to let you know that my 4 year old black and tan who’s name is Spencer is 4 today. I have attached a picture of him for you to see. He is a wonderful addition to our family and my 6 1/2 year ld and spencer play and do everything together. They are real buddy’s. I wanted you know how much we love this little dog, I don’t know what we would do without him. I have attached a picture of him so you can see how wonderful he looks as well as what a cutie he is. Spencer is the one in the front of the picture. The other one is Oliver which I go locally 61/2 years ago. To give you a better idea of who I am, I was the guy who’s house had the fire while on vacation four years ago and I thought it might be good for Oliver to have a brother after the trauma of the fire. “Just wanted to share some recent photos of the baby! Since the day we brought him home he fit right in! He learned the doggy door in 2 days and is doing great with his potty training! He has the best personality and we just adore him. We could not have asked for a better addition to our family. “Little Lexie has brought us so much happiness. She is just such a little doll ! She is smart, funny and full of herself. 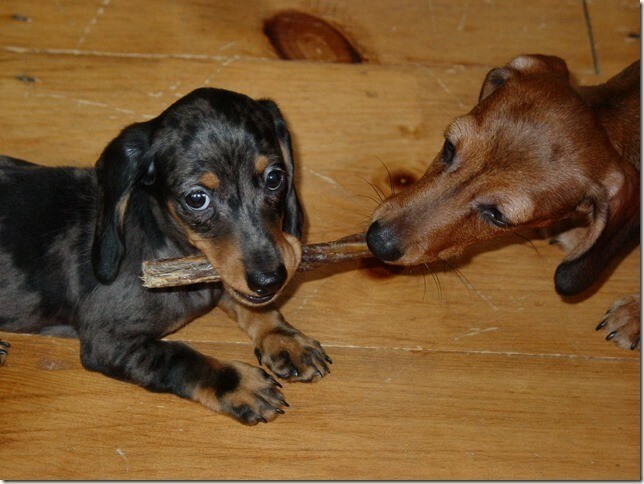 Fritz is her best friend and they play together, so well. She has been spayed and we had a microchip inserted, for safety and peace of mind, in case she evers wanders off, although our yard is fenced and she likes to know I am out there with her, so hopefully, we won’t ever have that worry !! This is Miss Echo–a “red” long-hair miniature and a real sweet dog that has and still is bringing us through many sad and happy family moments. I asked Lynda, 5 years ago, who I had never met, to please help me “find” a small, loving, non-aggressive dachshund pup. I was living at this time in Virginia, and only found her via Internet…and we all know how that can be a little concerning. 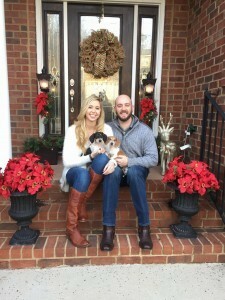 Well Lynda did find me a pup, and she chose a real winner for us! 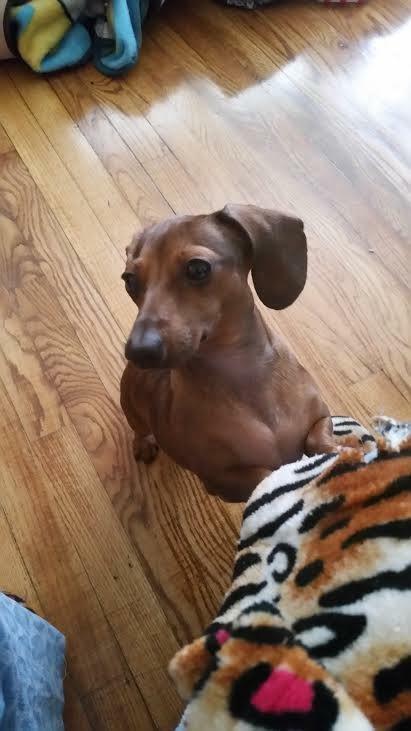 She was wonderful, talking me through the “history” of dachshunds and the different temperaments, and about caring for the puppy. I could tell quickly this lady KNEW what she was talking about and had a real pride for these pups. We drove from Virginia to Lynda and picked up pup Echo. Pup was delightful and perfect. Echo was just barely 3 month old, still learning her way in our home, when I got an emergency phone call that my mom had a stroke and was diagnosed with cancer. Not wanting to leave a pup still so young behind, we flew together to Texas (she was in a soft cage under the seat in front of me). Upon arrival, Echo comforted my mom for many months through her ordeal. Her soft so “pet able” fur, sweet temperament, quiet and calmness added the “light” that was so deeply needed. The love she gave was as you can expect very comforting. My mom today has recovered from the stroke, in remission from cancer, and is 91 years old! To compound this further, Echo’s job was still not done. My husband took ill with a heart condition. Many a times, Echo would calm him and at the same time with the pressure of “I gotta go OUT” getting him UP to move, do the needed for him the gentle walks, as well as for Echo too! Of course, not to leave myself out, my little girl has also been at my side as I did the care giving, those nervous moments we can all recognize when dealing with an ill loved one. So please say a cheer to Echo! She has worked very hard in this family. We love her dearly. 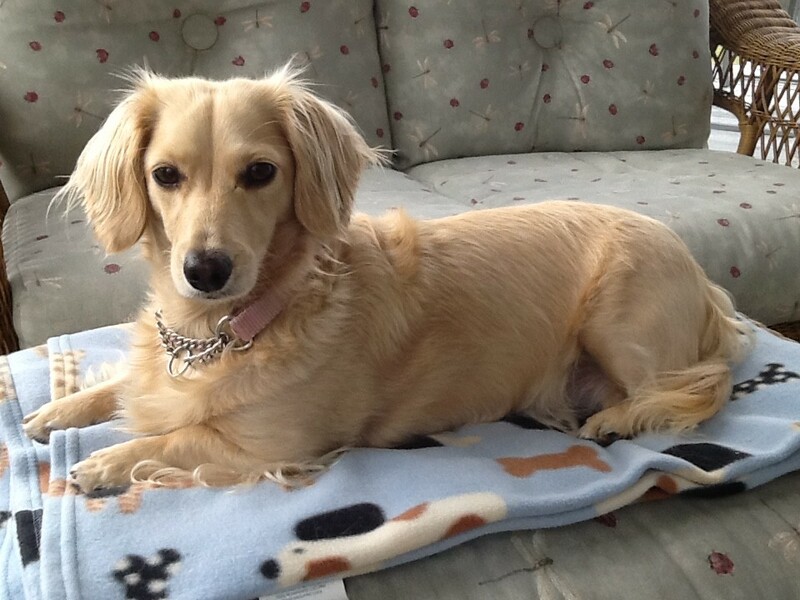 Thank you to Carters Dachshunds–and to Lynda, for bringing us such a sweet and wonderful dog to our lives. Woof!! I purchased a male English Cream Long Haired Doxie from you not quite a year ago. We named him ‘Saffron’ but we call him Ronnie or Ron Ron. He is absolutely adorable. OMG, his face is the cutest thing I’ve ever seen and his personality is equally adorable. Seriously. He’s spunky and happy and healthy. I just wanted to let you know how much we’ve enjoyed him. 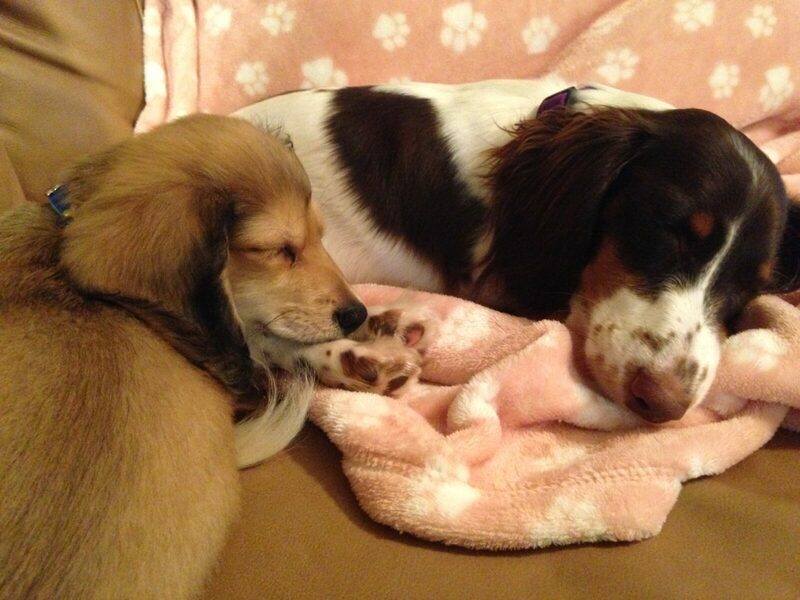 We have our piebald girl, Cinnamon, (the white spotted dog in a couple of the pics attached) and wanted a friend for her. She is calm, nurturing and affectionate – so we thought she needed a companion. We bought a puppy from another breeder but our vet told us to return her because she wasn’t healthy. Having to let go of a pup broke my daughters’ hearts. However, our vet flipped! over Saffron. She thought he was perfection (I think so too – ha ha). My boyfriend loves him so much that he keeps him several days a week. This pup has brought happiness to everyone in his life. We are so grateful for him. As his 6/15/16 (1st birthday) arrives, I reflect on how much we love him and how our lives wouldn’t be the same without him in it. 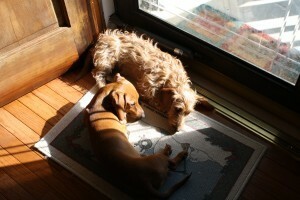 I think about how much Cinnamon loves him and treats him like she’s his Mommy (see the pics attached). The pic of her with her paw around Ron – she did that herself. It was spontaneous, not staged. 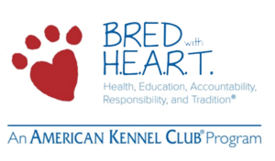 Thanks so much for being such a responsible breeder. You are building so many happy families. You have a ministry of sorts. When you are elbow deep in ‘yuck’, know how much your efforts mean to others and smile. 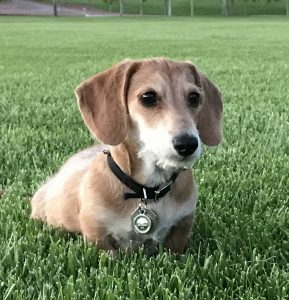 I’m still getting settled in my new home, with my new beautiful puppy, “Henry Waddlewurst Longfellow” (“Longfellow”, for short). I’ve been meaning to email you and send some pics… there’s been so much to do, but I’m including a few below and will send more as time goes by. The puppies (my daughter Rebekah’s short hair red pup born 4-9-16 is named “Snicklefritz”) got a clean bill of health at the vet a couple of weeks ago and they are going back tomorrow for their Lyme vaccine. The vet said they were “perfect and beautiful puppies”, which, of course, we already knew! I just want to let you know just how much these two wonderful doxies have brightened our lives. We are TOTALLY in love!!! They are adjusted and doing so well! Together, they are “TROUBLE”, but so much fun, and, most of all, so loved! Thank you so much for these precious little furry souls! 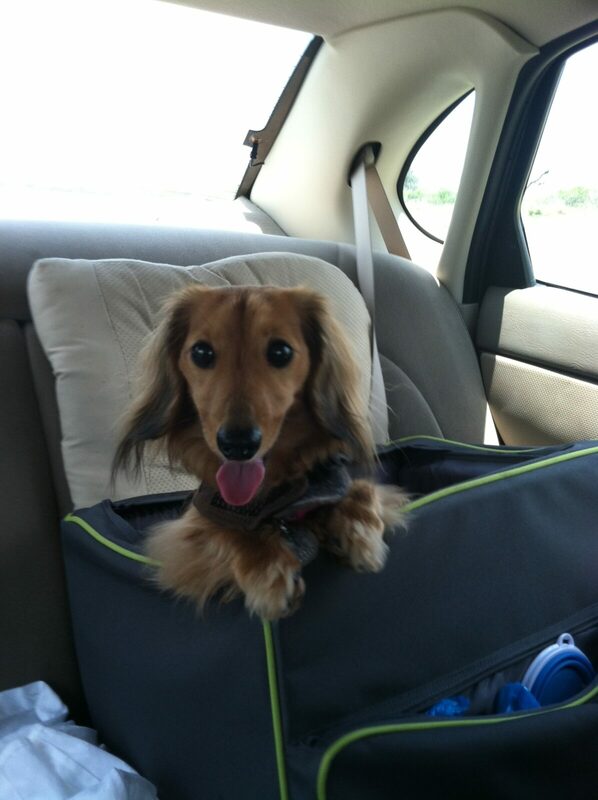 LAST YEAR, I WAS DEVASTATED WITH THE LOSS OF MY PET, PRECIOUS, (A DASCHUND) WHO I LOVED AND TOOK CARE OF FOR 14 YEARS… SHE PASSED AWAY LAST EASTER.. I WAS HEARTBROKEN…..SHE IS MISSED TREMONDOUSLY..FOR A FEW WEEKS, I FELT HELPLESS, WITH NO ONE TO TAKE CARE OF OR SPEND TIME WITH.. I STILL HAD A LOT OF LOVE TO GIVE, SO I STARTED TO SEARCH THE INTERNET.. 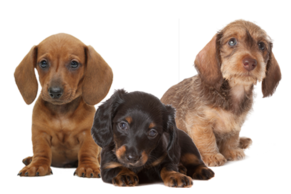 I LOVED THE DASCHUND BREED AND I WAS DETERMINED TO FIND ANOTHER DASCHUND BECAUSE I HAD A LOT OF LOVE TO GIVE….I FIRST CAME ACROSS A WEBSITE… WITH A REALLY SWEET LITTLE DASCHUND…. BUT THANKS TO THE QUICK CHECK FROM MY DAUGHTER IN LAW, I FOUND OUT THAT THEY WERE SCAMMERS…I WAS SADDENED AGAIN… BUT WAS NOT GOING TO GIVE UP.STILL SEARCHING, I CAME ACROSS CARTERS DOXIES AND I GAVE LYNDA A CALL….THAT PHONE CALL CHANGED MY LIFE. JUST SPEAKING WITH LYNDA, I KNEW SHE WAS A VERY NICE, KIND, LOVING AND UNDERSTANDING WOMAN…I FELT THE WARMTH OF HER KINDNESS.. I SAW A PICTURE OF PETUNIA AND FELL IN LOVE….. I KNEW PETUNIA WAS MEANT FOR ME. A FEW WEEKS LATER LYNDA ARRANGED FOR PETUNIA TO BE SENT TO ME TO NEW JERSEY… MY HUSBAND AND I PICKED HER UP AT THE AIRPORT…. 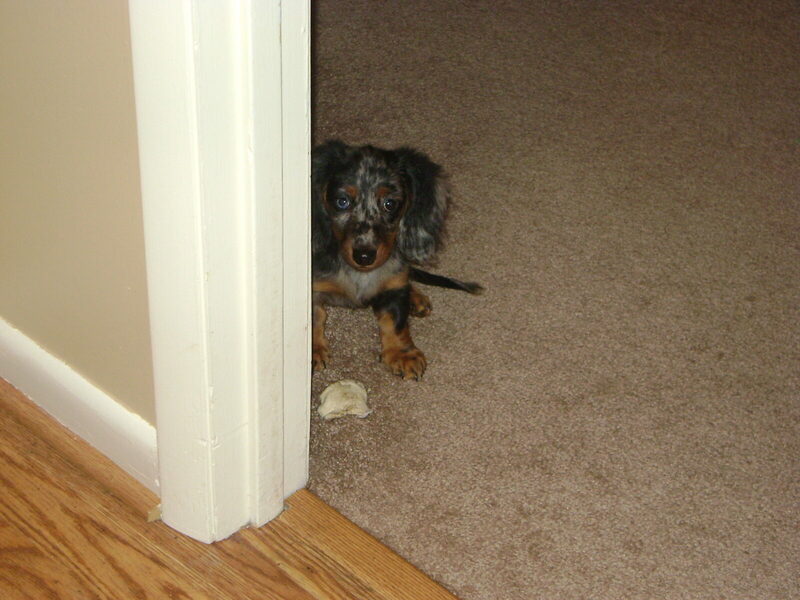 WHEN WE FIRST SAW HER, SHE WAS HESITANT GETTING OUT OF THE CRATE…. BUT WHEN SHE FINALLY CAME OUT SHE WALKED IN THE GRASS BY THE AIRPORT, THEN SHE STARTING RUNNING AROUND WAGGING HER TAIL. 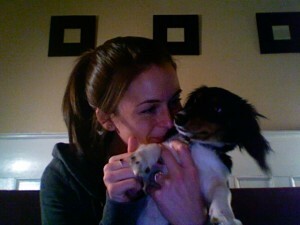 I KNEW SHE WOULD BE HAPPY, AND WHEN WE WERE GETTING READY TO WALK TO THE CAR TO GO HOME, SHE LICKED ME ON THE CHEEK. I KNEW SHE WAS GOING TO LOVE ME. PETUNIA GOES TO A VET, CLOSE TO MY HOUSE AND EVERYONE THERE LOVES HER TOO..